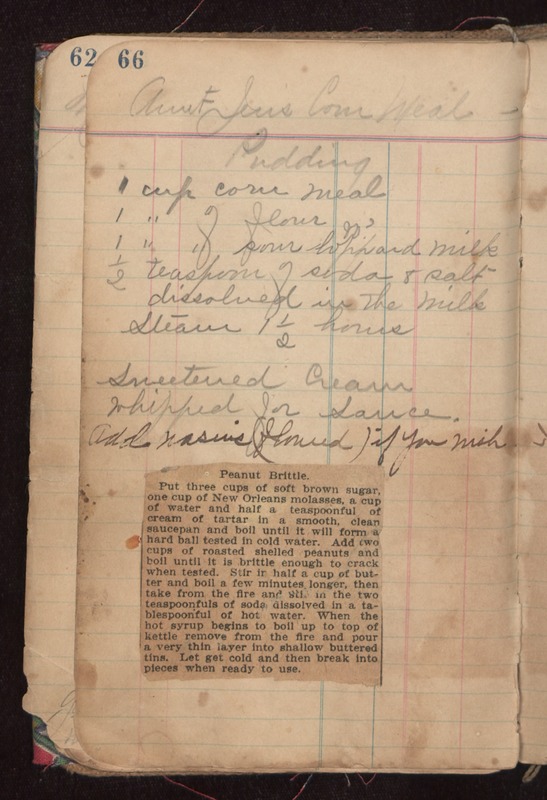 Aunt Jen's Corn Meal Pudding 1 cup corn meal 1 " of flour 1 " of sour loppard do? milk 1/2 teaspoon of soda & salt dissolved in the milk Steam 1 1/2 hours Sweetened Cream Whipped for sauce. Add rasins (floured) if you wish Peanut Brittle. Put three cups of soft brown sugar, one cup of New Orleans molasses, a cup of water and half a teaspoonful of cream of tartar in a smooth, clean saucepan and boil until it will form a hard ball tested in cold water. Add two cups of roasted shelled peanuts and boil until it is brittle enough to crack when tested. Stir in half a cup of butter and boil a few minutes longer, then take from the fire and stir in the two teaspoonfuls of soda dissolved in a tablespoonful of hot water. When the hot syrup begins to boil up to top of kettle remove from the fire and pour a very thin layer into shallow buttered tins. Let get cold and then break into pieces when ready to use.